Trump's threat will not make things better (and the notion of actually closing the border is insane). 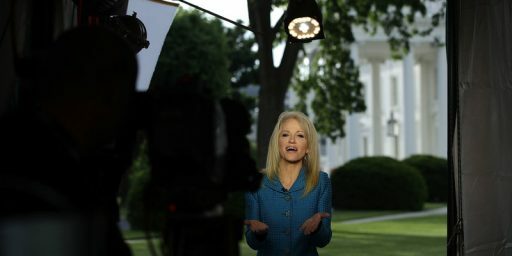 I will start off by saying that Conway is actually right, at least in part, on the macro level: we need a significant overhaul of our immigration laws and system, and the responsibility for that overhaul is squarely within the purview of Congress. And Congress has, in fact, failed in this area. Before 2016, and in some cases as recently as six months ago, they would have had no problem and no delay. But for the last several months, the Trump administration has made a practice of limiting the number of asylum seekers allowed to enter the US each day — a policy it calls “metering.” It’s the counterpart of the Trump administration’s months-long crackdown on asylum seekers entering the US illegally — telling those who do try to come legally that there’s no room for them, and ordering them to wait. They don’t say how long the wait will be. And there’s no official way for asylum seekers to hold their spot or secure an appointment, no guarantee that they’ll ever be allowed to cross. The agency is relying on a process called “metering” to limit the number of people who can be processed daily for asylum. Thousands of migrants are waiting on the Mexican side of the border as Customs and Border Protection officers process small numbers of people — 40 to 100 — each day. So, let take very desperate people, make their situation more desperate, and then expect then not to behave even more desperately? This defies any understanding of human behavior. Kevin McAleenan, the head of U.S. Customs and Border Protection, summed up the problem: Central American families “know that DHS must release them within 20 days, under court order, and that they will be allowed to stay in the U.S. indefinitely while awaiting immigration court proceedings.” With a growing backlog of nearly 830,000 cases, the wait can be years. In any event, the result is perverse: More asylum seekers are crossing the border illegally, in large groups, with the aim of turning themselves in. This is good news for the cartels that profit from their plight and use the ensuing distraction to draw resources away from policing drug-smuggling elsewhere on the border. The answer isn’t walls and states of emergency, but more immigration judges and better policies. Process cases faster and the incentive to file bogus claims would diminish. That means appointing more judges, fixing the courts’ paper-based record-keeping system, hiring more asylum officers and letting them bring cases to conclusion. Press Mexico to control its southern border, where enforcement has lagged under the new administration. Don’t cut aid to Central America: Boost it, to strengthen justice and expand economic opportunity. Beyond all of that, the notion of closing the US-Mexican border is simply insane. 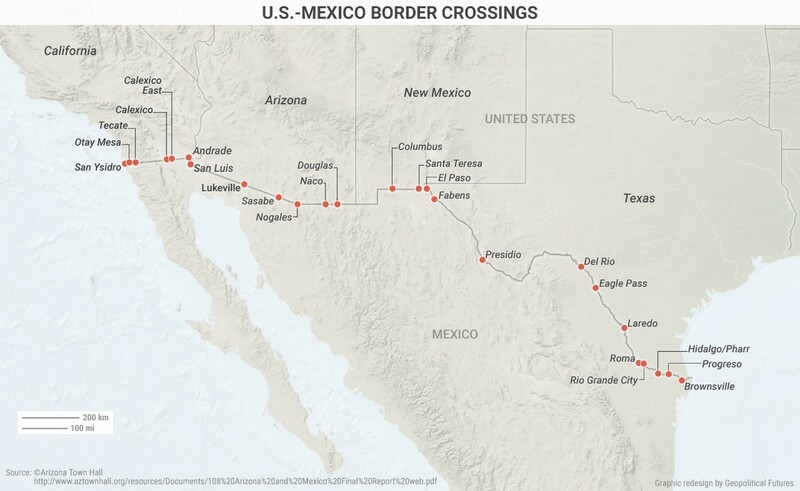 There are almost one million legal crossings (by foot, by car, by bus, by truck, etc,) a day between the US and Mexico. There are massive amounts of economic activity across that border daily. And it isn’t just Mexicans who make money off those crossings. Mexico is the US’ largest trading partner in the world. And, of course, these border communities are symbiotically tied together–people live on one side of the border, and work on the other. Families live on both sides. But sure, let’s just close it down, which won’t stop illegal crossings, by way, it will just shut down the legal one. We desperately need some fundamental realism on the nature of the border, as well as the nature of the problems we are currently facing. We need policies aimed at families seeking asylum, not individuals crossing primarily for jobs. We need a better legal regime, and we need to move off simplistic answers like walls. A lot of people also need to recognize the overwhelmingly positive aspects of our relationship with Mexico and with migrants from the south. People wondering what’s delaying the next recession can relax: closing down all trade with Mexico should do the trick. Will legal employees who work in the United States and live in Estados Unidos Mexicanos who are prohibited from crossing the border to engage in their legal, gainful employment qualify to collect unemployment benefits that their legal employers have been paying for? Trade volumes aside, and these are huge, there’ slots of tourism as well. Mexicans visit border towns to go shopping in the US. Tijuana is a special case (and a free port, so you don’t even need a passport), but the legal drinking age in mexico is 18, so lots of young Americans cross the border to party. All that aside, too, there’s much that could be done if the border were integrated more closely. For example, Tijuana’s airport is right at the border line. A pedestrian bridge was built that leads to the US side, called the cross-border express or something like that. You can park your car in San Diego, and take a flight in Tijuana to elsewhere in Mexico (immigration is taken care of at the bridge). This is nice, but limited. Consider Reynosa/McAllen. they both have airports, which are a mere 24 km apart (abt. 15 miles). Wouldn’t it make more sense to have one airport for both cities? Especially so as they’re both low-traffic as far as I know, with some general aviation as well. Flip a coin and designate the unified airport on either side, then run a dedicated shuttle bus/van for a reasonable fee, all immigration and customs to be handled at the airport (to speed border crossings). Much the same could be done at other border pairs like El Paso/Juarez, Laredo/Nuevo Laredo, and perhaps elsewhere. Absolutely correct. Our narcissistic egotistical leader has no understanding of human behavior. It just ain’t in him. One question I haven’t seen answered anywhere: Does trump actually have the power to close down border crossings, or is that another unconstitutional power grab? @HankP:…or is that another unconstitutional power grab? This is a National Emergency! Emperor Pud can do anything he wants! How do we get the refugees to decide that Mexico is good enough? The refugees are from further south, and are walking a thousand miles or so through Mexico. We have a thousand miles of opportunity to get them to stop. Can we give Mexico a Statue of Liberty of their own? We don’t want these refugees. Yes, we are a strong enough country that we could absorb them just fine. Yes, unemployment is basically nil, and we need workers — even unskilled workers. It’s stupid, but, we don’t want them. Our loss there. But if we don’t want them, we should be doing more to stop them long before they get to our borders. Make Mexico Great Again. I get the joke, but I was not aware that the President can just shut down the border whenever he feels like it. Whatever keeps us from embracing realism in this instance is almost certainly what keeps us from embracing it in so many others. Discovering and curing this mysterious malaise is the great project of our time. @HankP: I believe the president has the statutory power, but I am not sure of the scope. Nixon did early in the drug war (Operation: Intercept) and Reagan did it (I think it was after the murder of a DEA agent). Supreme Court Justice Bluster will consult this document and get back to you. Steven – I knew past Presidents have done it temporarily or increased security/searching, but I wasn’t aware that a President could just shut it down completely, for any length of time, for any reason whatsoever. @HankP: My guess is that if he tried to do that, the courts would be involved quickly as I don’t think that we know how far the statute stretches. If Dennison thinks he can close the border for over a month, and reap any benefits, he’d better think again (I know, asking the impossible). @Michael: I disagree. He understands perfectly. He knows that since we can’t possibly take all of the world’s desperate people, we shouldn’t be in the asylum business at all. While it is sad, many people are going to have to resign themselves to dying in various refugee centers around the world–killed by narco-terrorists, ISIL radicals, Boko Haram, and whoever else is killing people and driving them from their homes. 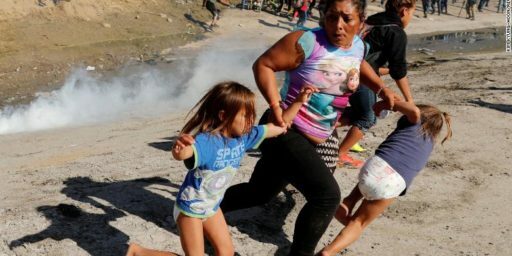 And while these people are certainly deserving of some sympathy, their plight is not the fault of the United States (even when it is) because if their forebearers had not chosen to live in shithole countries, they wouldn’t be facing the hardships they are facing now. Trump gets all of this. It’s the people who are opposing him that don’t get it. Is it just me, or does closing down the Mexican border seem like a very solid way to make sure Arizona and New Mexico go blue in the next election, and put Texas in play? I mean, wow, that’s not a small thing. That’s not a small impact. I am not for it, I’m against it. But it’s gobsmacking how dumb it is. And now they want to shut down a border that has a million crossings a day. That’s going to hurt a lot of people, a good number of whom vote. My bet is that it’s a “fake” closure. A few crossings will close, for a little while. Long enough to get TV coverage, and then it will be “clarified” to something that’s nearly meaningless, but he made his headlines anyway. @Jay L Gischer: It’s possible that Trump has finally figured out the swerve that he should have gone with on wall funding and will declare this knowing that Congress and the courts will block it and then spend a week or three complaining that he had the solution to the problem but no one will let him do what’s necessary. I also realize that my scenario is unlikely because Trump’s learning curve is so steep, but it’s still possible, I guess. What about the fact that he is trying to take away the rights of American citizens to cross the border into Mexico? I am scheduled to drive across the border on April 23. I have to be there the following week, because I am getting married. Will Mexico also close their incoming border? This is such a nightmare, and it should not affect law-abiding citizens. @Jay L Gischer: My bet is that it’s a “fake” closure. A few crossings will close, for a little while. Long enough to get TV coverage, and then he will declare victory and send all the troops home. Long enough to get TV coverage, and then he will declare victory and send all the troops home. He can’t declare victory. He excites his base by fighting immigration. Winning would end the game.